I´ve had melasma for several years. Today the melasma is almost gone due to a cutan liquid I got from my doctor and also trying to avoid the sun (that´s the worst part). The liquid containt hydrochinone (instead of hydroquinone), tretinon and vit c, so today there is only a shadow, only visible to me, instead of the brown mask, I had when I started treatment. I guess the trick to get rid of melasma is patience. But here is my question, I read somewhere in this forum that you can only dermaroll with a needle less than 0.5 mm, because of the risk of inflamation? 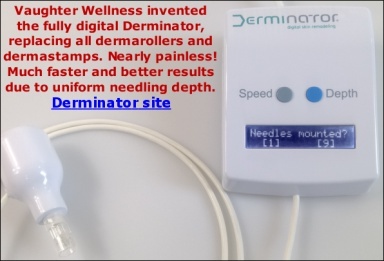 Is that so, I have just bought a 0.5 mm and I have no inflamation on my skin, isn´t safe to use the 0.5 dermaroller? And do you recommend that I apply the vit c serum first and then dermarolling or should I wait till after to apply the vit c serum? Thanks for your kind answer, it is securing to have such a honest person to guide one:-) I am also very happy to get rid of the mask, it was very "painful" to have, it was the only thing I looked at, when I saw my self in the mirror. I have made many mistakes in my skin regimes, during these years. The worst mistake I have made, was putting concentrated vit c oil (from aromatherapy) on the mask, and then going out in the sun, trying to swicth out the skin:-( I was tottally black on the mask, it was terrible. But I forgot before, to tell about my rosehip oil, that is really so good for the skin, this oil together with the serum from the doctor and really trying to avoid the sun (50 or 60 SPF every day and hat in the summer), has been the recipe to get rid of my melasma. So I will start very carefully, with dermarolling with the 0.5 mm two times a week over the summer. And then first try the 1.5 in the fall. The vit c serum will I use the days in between. Lisa;1616 wrote: I´ve had melasma for several years. Today the melasma is almost gone due to a cutan liquid I got from my doctor and also trying to avoid the sun (that´s the worst part). The liquid containt hydrochinone (instead of hydroquinone), tretinon and vit c, so today there is only a shadow, only visible to me, instead of the brown mask, I had when I started treatment. I guess the trick to get rid of melasma is patience. I was curious about that cutan liquid you used. I have melasma also and saw on another forum where someone used a compound prescription that seems similar to the one you described. Could you post more information on this cutan liquid? The ingredients and the prescription strength (%) of each one. Is it a compound prescription or is Cutan the brand name? Thanks so much. It has to be kept cool in the refrigerator. You will peel sometimes from the liquid, but mostly in the beginning. Be very carefully witrh the sun and always only put it on at night.The good part is that is very helps, I have hydrochinon in instead of hydroquinone, I have heaerd so many bad things about that, but I should really persuade the doctor to leave out the hydroquinone. Thanks so much for the information Lisa. Hydrochinon and hydroquinone are the same thing right? I looked it up and it seems that it is the same medicine but named differently in Europe. (I'm in the U.S.) Anyway the three main ingredients in the prescription I have are tretinoin, ascorbic acid and hydroquinone, I am going to take a copy of the compound prescription I saw and your list to my dermatologist and see what she suggests. I have heard that hydroquinone can be bad for you if used long-term but I hopefully won't need it too long. I have one more question, I hope you don't mind. How long before you saw results after you started using the Cutan liquid? i read that hydroquinone is dangerous to the skin and some other posters in different forums agree with me. so it's right to conclude that skin lightening creams like Metaderm that has no hydroquinone content is safe? metaderm, btw, can be used for melasma.